I have a new love in my life. It comes in the form of cheesecake cakes. Seriously. I first fell in love when I made THIS pumpkin cheesecake cake. Now I’ve made a new version for Christmas. YOU MUST TRY THIS. You can make it this weekend to get yourself in the spirit. Or save the recipe for the holidays when you want to impress people with your cake making skills. The best part? You can make each layer on a different day, and freeze them so they are ready when you want to assemble! You’re welcome. Now, I have all the fun holiday treats planned out…what to get for gifts for family is a whole ‘nother story! Time to start shopping! 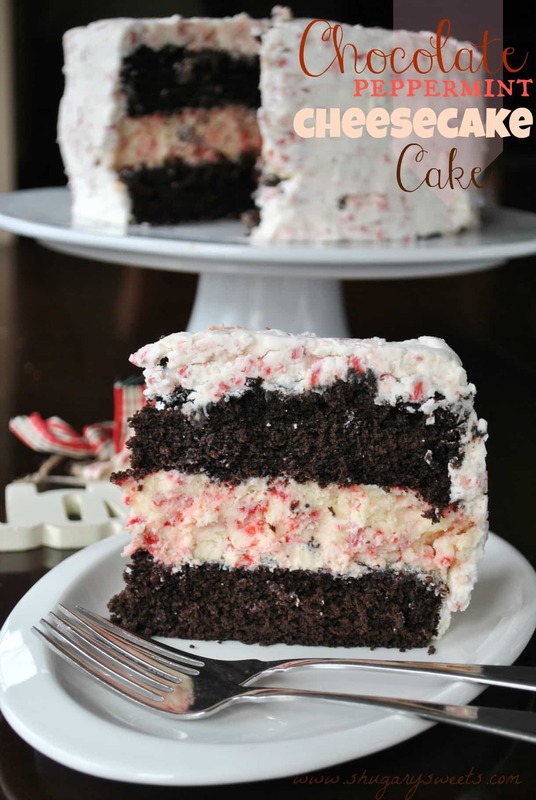 If you like this Chocolate Peppermint Cheesecake Cake, you may also enjoy these recipes…. Layers of chocolate cake with pepperming cheesecake filling and peppermint frosting! In a small bowl, mix flour, cocoa, salt, baking soda and baking powder. Set aside. 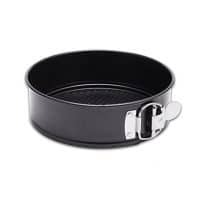 Grease 2- 9inch round baking pans and line the bottom with parchment paper. Set aside. IN mixer, beat butter and sugar for 5 minutes, until smooth. Add eggs, one at a time. Slowly add in dry ingredients alternating with the coffee and milk mixture, about 3 additions of each. Pour cake batter evenly into the 2 prepared pans. 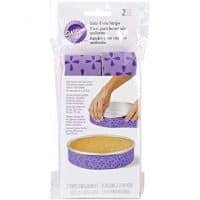 I also use Wilton's Baking Strips on my pans to keep the cakes from getting rounded on the tops (I found them at Michaels). Bake in a 350 degree oven for 25 minutes. Remove and cool on wire rack. When completely cooled, you can wrap each layer in plastic wrap and put in the freezer for later assembly! Beat cream cheese with granulated sugar for 2-3 minutes until creamy. Add in salt and eggs, one at a time, beating well after each addition. Beat in sour cream, heavy cream and peppermint extract. Fold in baking chips. Pour into prepared 9inch springform pan. Place pan in center of preheated roasting pan in the oven. Pour boiling water slowly into the roasting pan, until there is about an inch of water coming up the sides of the springform pan. When cooled, transfer entire springform pan into the freezer for several hours or overnight. I put it in freezer for about 2 hours. Remove cheesecake and wrap in plastic wrap and return to freezer, or assemble cake. beat butter for 3 minutes. Add powdered sugar and heavy cream and beat an additional 3-5 minutes until fluffy. Add baking chips. To assemble the cake, lay one frozen layer of chocolate cake on cake plate. Top with frozen cheesecake and second layer of chocolate cake. Frost sides and top with a thin layer of frosting to apply a crumb coat. Refrigerate 30 minutes to an hour. Remove from refrigerator and frost remaining cake. I keep the cake covered in the refrigerator until ready to eat. Remove and allow to sit about 15 minutes before slicing. ENJOY! Holy moly, I need this in my life! 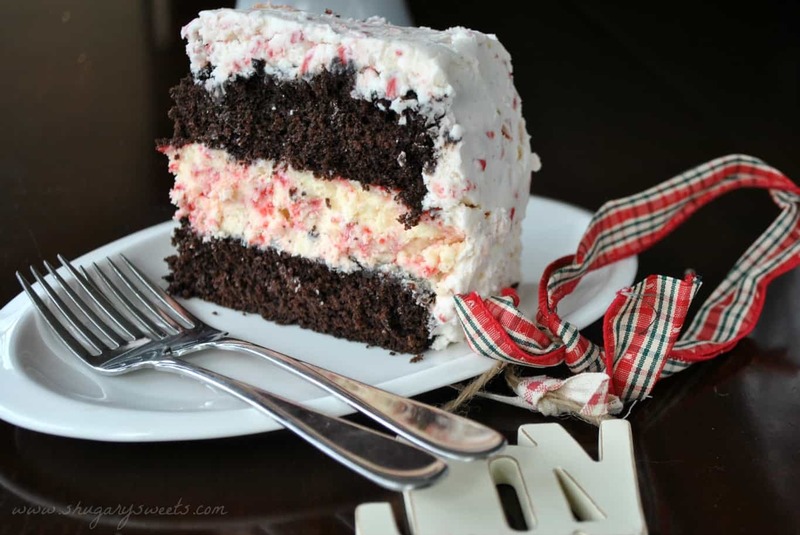 This reminds me of the peppermint cheesecake at Cheesecake Factory–one of my favorites–but in a luscious CAKE form! Genius! Thanks Hayley! I haven’t had the one from Cheesecake Factory, but I imagine it’s good (I love their Red Velvet version)! Oh yum!!!! This looks absolutely amazing!!! Peppermint and chocolate is such a great combo this time of the year!!!! That’s why we get along Jocelyn 🙂 We both love the same things (mostly…hehehe.) Bacon cheesecake next? Bacon cheesecake could work, I make savory cheesecakebites with mushrooms and shallots and herbs. Let me know if you try it! YUM!! Now THIS is a cake! I was going to post a cake tomorrow, but it’s going out Tuesday. It’s choclaty and a holiday/celebration cake and now that we’ve eaten it all, I think your cake needs to be next. It’s gorgeous and the layers are PERFECT! Thanks Averie! Can’t wait to see YOUR cake! Yes, I’m convinced – this is the PRETTIES cake I’ve ever, ever, EVER seen! So wonderful for the holidays – I’ve been baking with those andes mint peppermint chips, too! I love them. So festive. Aimee, I am in love with this – cheesecake is my weakness!! Aww, so sweet, thanks Sally. It was fun to make (and eat)! WOW. 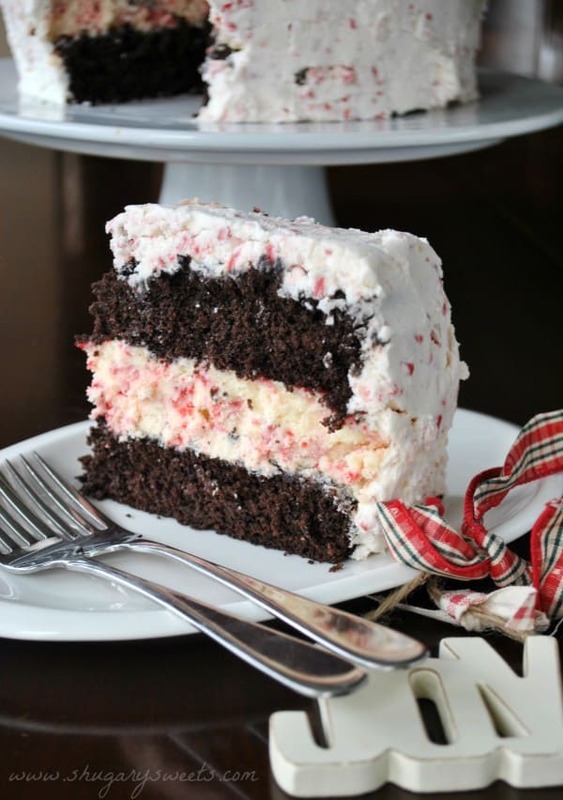 I love the cheesecake cakes – peppermint is my favorite holiday flavor. I’m dying for this! You and me both Dorothy…I love peppermint! Wowzers! What a beautiful cake and perfect for the Holidays! This looks so amazing!! I just adore all things candy cane!! Do you happen to have a gingerbread cheesecake recipe?? I will be making this! I love peppermint flavored treats this time of the year especially, and this looks perfectly delicious! This cake looks so amazing! Gaah this is gorgeous! I am so envious of those who can make cheesecake cakes…it’s such a feat! A slice of this right now would make my life complete! Oh my! We are die-hard cheesecake fans at my house, and a peppermint version–with cake??? Seriously, get in my tummy! This is gorgeous! Oh that sounds amazing!! I love peppermint & cheesecake so pairing them makes total sense. YUM! Oh my word…wow. This looks amazing.! What a gorgeous dessert! This cheesecake cake would make a perfect addition to Christmas parties! First fudge, now cheesecake??!! You must be the most popular person in Ohio 🙂 Love the recipe & photos. Cannot wait to try for my work friends…thanks for making it easy to print!!!! What? Cheesecake cake?! I didn’t even know it was a thing, and now I must…have…one. I would share if I had any left…. Wow! This cake is all kinds of beautiful!!! Found you through Dorothy’s link up party. This looks absolutely divine and gorgeous to boot! I think I have said Oh my gosh like 500 times while reading this post. I want this cake SO bad! Happy Holidays! Do you think I could make the layers now (6 days before), and keep them frozen until Wednesday? This is amazing! Thank you very kindly! Thank you so very kindly! Have a wonderful Thanksgiving <3 I will be happy to share the outcome of my cake if you wish? Yes! Please let me know how it turns out! ENJOY! Oh my mercy… YUM!!! love choc and peppermint!! Chocolate and peppermint! Ah! Yum. oh wow. This looks like all of my favorite things combined in one heavenly dessert! I would be honored if you shared this at my Ginger Jamboree Link Party! What a beautiful cake… and it sounds delicious. Pinned to try soon! Thank you Jennifer! So happy to have you following! This looks amazing & might make it for my birthday! BUT is there a good substitute for the coffee??? You don’t have to use coffee, you can substitute water. But the coffee brings out the chocolate flavor (and doesn’t make it taste like coffee at all)!! Do you have any substitution ideas for the Andes Peppermint Crunch Baking Chips? I think they’ve been discontinued. I can only find them online at very inflated prices. Thanks! Hey Erin. I just made this cake this past week. Couldn’t find the Baking Chips anywhere. I finally found Andes Peppermint Crunch little rectangle candy things that have the candy cane design on them at Target. I bought those and chopped them up. (Got a blister from it too! UGH!) It turned out great…just annoyed that I couldn’t find them anywhere and had to do all that extra chopping. You could maybe order them online http://www.ecrater.com/p/16270173/andes-peppermint-crunch-baking-chips-10?gps=1 This is the only place I’ve found where you can order them…maybe you’ll have better luck if you look…I may decide to go that route next time to save on time. You may also be able to try Hershey Kiss Candy Cane kisses, chopped. Or regular Andes Mint Chips, it would just give it a chocolate/green mint look instead of red. Thanks, Melissa! I actually finally found the chips today at Walmart. They were on a shelf unit in the middle of the large aisle next to the baking aisle. The shelves were full of holiday-related baking products. Before I found them, I did have the rectangle candies in my hand, but I was not looking forward to unwrapping and chopping them all. Ugh! I was ready to give up and saw the chips at the last minute–yay! Thanks for the helpful reply! 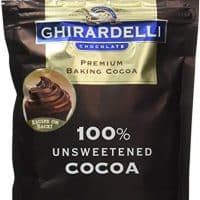 I had also read about someone substituting the Ghirardelli Peppermint Bark Baking Bar, chopped. I don’t know how similar it is, but it might work. Thank you Kim, what a compliment! Yum!! I just made this cake this week…and yes, it pretty much took me the whole week. Wanted to try it out to see if I want to make it for Christmas…and OH BOY!! I am SOOOOO making it at Christmas!!! It was so nice to be able to do it in steps and freeze them. I am sitting here enjoying a piece right now…and I mean I’m REALLY ENJOYING it!! It is so amazing!! I cheated and used Betty Crocker’s Gluten Free chocolate cake mix, since I can’t eat gluten and didn’t feel like experimenting when I know her GF cakes are good. And let me tell you…I have been gluten free for a little over a year now, and this is probably the BEST dessert that I have had in that time. Thanks for sharing the recipe!! I am so glad you enjoyed this cake! And that you are able to make it Gluten Free! Thanks for sharing your feedback, makes my day to hear people enjoying my recipes! Melissa, I am glad you posted this! I am going to make this for Christmas and was planning to use Betty’s GF cake since I am GF too! Glad to know it turned out. Can’t wait to try it! Sounds gorgeous! I’d love to see a picture if you had time (you can share it on my facebook)!! I made this on Friday night for a party we went to yesterday and it was fabulous! It was the first cake/cheesecake I have made and I couldn’t believe how pretty it turned out! When I took it to the party people kept asking if I made it because they thought I bought it 🙂 I ended up making the two chocolate cakes and cheesecake on Friday night, wrapped them in plastic wrap and froze overnight. Then I assembled everything and frosted the next day. I bake from scratch regularly and am used to making complicated recipes, but I have to say this did take longer than I expected so I’m glad I spread it out over two days. I loved the dark chocolate flavor with the peppermint cheesecake and then the buttercream frosting was the perfect addition. The only comment I received was that there may have been a bit too much peppermint, so next time I will probably cut the Andes baking chips in half for the frosting instead of using the whole bag. I see above you asked for a picture from another reader on FB so I will find you and post mine too – I am a total foodie and take pictures of all my creations 🙂 Thanks for sharing a great recipe, this was the perfect thing to make for a Christmas party – it tasted great and looked so festive! Ashley, Thank you so much for the feedback! It is a little tedious the stages of making this cake…but so so worth it! I’m so glad you all enjoyed it. I love peppermint, so for me it was perfect, but I can see how it might be a bit much. Thank you also for the photo on facebook, it turned out gorgeous!!! No problem at all – thanks for sharing the recipe! This looks absolutely amazing! My family loves peppermint, the only thing is we don’t like coffee, is there a way I can make this without the coffee or substitute it with something else? I’m really wanting to make this so I am hoping you have a suggestion for me!! You can take the coffee out and just use more milk in it’s place. The coffee doesn’t make the cake taste like coffee, if that’s what you’re worried about. It just enhances the chocolate flavor! But, if you don’t want it, use milk! Or water. What would you think of using chocolate ganache instead of the frosting? Would that be TOO much? I think that would be a lovely substitution! There is enough peppermint in the cheesecake to give it the peppermint flavor (although you could always sprinkle peppermint on top of the ganache if you’d like! YUM. 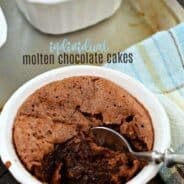 I went to the store today so I can make this for Christmas Eve but could not find the Andes Crunch Baking Bits at all. They did have Ghiradelli GREEN mint baking morsels. Can I use those? Also, I have a bottle of candy cane bits (for decorating), there is no chocolate just the candy cane pieces, I guess I could put those in the cheesecake. Which do you think would be better? I made the cake with the green peppermint chips and it tasted great, although not as pretty (in my opinion) as the red would have been. I used dark chocolate ganache instead of frosting and it was incredible. (My family is partial to ganache!) I made the cake for the Christmas Eve party and, well, let’s just say, there isn’t any left this morning!! 🙂 I was actually surprised at how easy it was to make and assemble. The only tip I would give to anyone else using ganache is to frost the whole thing very thinly with a chocolate buttercream first. Chill it and THEN pour on the ganache (for a more professional smooth finish). My top was nice and smooth the sides of my cake (without the buttercream layer) were “bumpy”. Thanks so much for sharing your recipe! Merry Christmas! Looks delicious! I want to try, but need a substitution for the coffee…any suggestions? Hi Natasha, you can use skim milk or water to replace the coffee. Either works just fine!!! About how many serving are in one cake? I really want this for my vow renewal/anniversary party, but with 100-120 people present, I’m not sure how many or how big I should make it. I’m having trouble finding the baking chips. I do have a 5 lb bag of mini candy canes that have yet to be put to use though…would those chopped up be okay to use? Or do they have to be soft like the Hershey candy cane kisses? (I saw that in a previous comment!) or maybe both of them mixed together?? 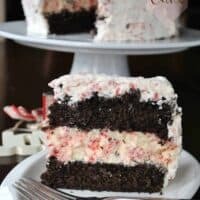 I love peppermint but want the right texture and don’t want to ruin a beautiful recipe like this! I cant think of any words that would describe how good this is!!!! This looks amazing…I want to make it for Christmas but we don’t drink coffee. . . Any suggestions for a substitution? Thanks! Oh never mind …just saw the above comment…sorry! Out of curiosity, is the cheesecake supposed to be fairly soft? Ummm, it should be soft like a normal cheesecake texture….hope that helps! 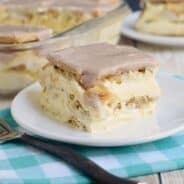 I don’t have a roasting pan that will fit my springform pan – how do you recommend I change the baking of the cheesecake if I can’t do that part? I would put a large baking sheet with water under the springform pan. 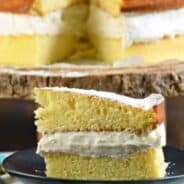 i don’t drink coffee, is there a replacement that I can use instead of brewed coffee in this cake recipe? Just want to say thank you for this! Making it now to serve at our Christmas dinner! Cannot wait to try it! Just had this for dessert after Christmas dinner. All my mom could say was, “Wow!” Thank you for an absolutely delicious recipe!!! I made this last night and it was delicious!! I did want to share a couple of changes I made (not really because it needed it, mind you:) that made this already awesome cake even more awesome. First, I omitted the peppermint chips in the frosting – partially because I didn’t have enough and secondly, because I thought the crunch from the chips in the cheesecake would be enough. So instead, I added about 3/4(ish) tsp. peppermint extract. Then (because I love decadence and am an extreme chocoholic:-), I also added a ganache to go over the frosting – yeah, it was good… Thanks Aimee for an incredible recipe!! I made this last week for Christmas and it was delicious. I did cheat a little and used boxed devil’s food cake and it still turned out really well. I missed that I needed two bags of the Andes chips so when I went back to the store to get a second bag they were all gone. I used crushed peppermint in the frosting and was happily surprised when it retained its crunch. Thanks for sharing this delicious recipe. I love chocolate and peppermint! This was awesome! I made a different peppermint frosting to go on it (a cooked flour one) and used Ghirardelli peppermint bark in placed of the Andes. The cheesecake baking method was perfect and I had no cracks and the whole cake itself was exceptional- I was not the only one who went back for seconds. This is definitely going to be making another appearance some other time. Pingback: 69 Perfect Peppermint Christmas Desserts: Holiday Sweets - Joy Pea Health | Food. Drink. Nutrition. Wellness. Made this dessert for a special party. Took my leftovers to work and a coworker requested one for Christmas Day. So I made two. One for her one for me. Happy Holidays!